You will rarely need to know what the Bisaro pig is. It’s a pig, which is more than our party knew at the Portuguese restaurant on Friday night, when we collectively failed to ask the waiter for a translation. None of us had it, nor its accompanying sweet potato mash and pickled baby onion sauce. The Bisaro is not just a pig. It’s a central and northern Portuguese pig, part-boar, of Celtic origins. The breed was classified by J.F. Macedo Pinto in the nineteenth century as “Bizaro Type 1, or Celtic”. Supposedly, it originated in Gaul. Its labeling could hardly be more mythic, more Asterixian. Bisaro pigs grow to a meter tall at the shoulder, and a meter-and-a-half in length from shoulder to tail. They look like this, approximately. 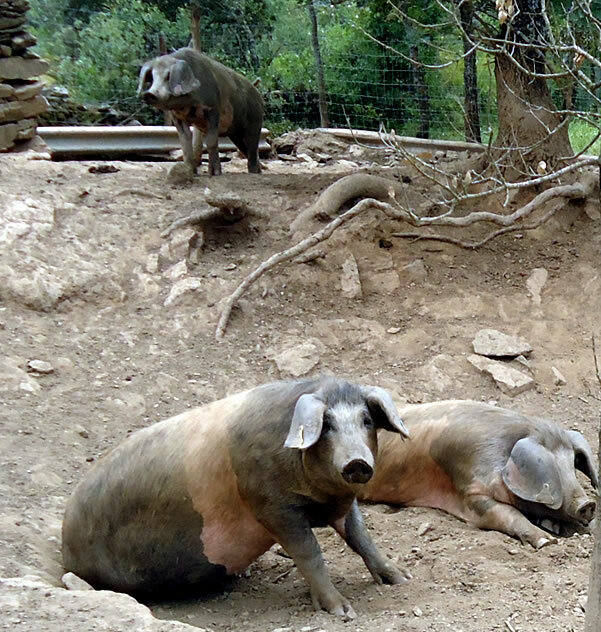 Their iterations, for comparison, were studied for genetic origins in the c. 1999 article, “Genetic characterization and inventory of the Bísaro pig through visible effect genes. Their utilization in the genotypic comparison between populations and in the establishing of a nucleus for in vivo genetic conservation” (PDF). In the article, the pig is regularly referred to as the “ancient Bisaro”. Since breeds were first systematically categorized in the nineteenth century, it’s rather hard to say just how much the modern version of the breed resembles the pig-boars known to what would have been Asterix’s companions. (Had he, y’know, been real.) As a living, breeding creature, however, odds are it has developed and changed over the intervening centuries quite a bit, if not as much as languages do.